Coming in sideways, I am running late with this post, which is no way to treat the slew of you who read and responded to my last post. Before I start a new entry, I assemble the photos on hand, which gives me my jumping off point for stories and details. By the time we reached this project—Pippen Hill, #32 in 1984—we were switching from prints to slides, as they reproduced better for publicity. Over the past ten days I’ve been teaching myself to scan slides, in a new scanner, which is tricky, especially when it comes to trying to improve the look of under-exposed film. This old dog is slow to learn new tricks—not that I can’t, but I can almost hear the wheels creaking around (or not) as I move from one step to the next. Because you all have responded so well to the photos, I hope to include more of them as we go along. Some are not that great, but they show detail that you might otherwise miss. As another sideline, you might be interested to know that the last post, about the Craftsman Bungalow, had the largest response (other than the posting that mentioned both Barry Manilow and married…but that was a whole other group of people) in one day–476 of you. WordPress, the blog host, makes it easy to obsess on one’s stats—it’s impossible not to peek every hour or so after a new post is up to see how many people have read it. Overall, since this began (January 2011), nearly nearly 26,000 hits have been made on the site. By big blog standards, that’s not much, but for us it’s pretty great. Thank you all. Okay, on to Pippen Hill, Part I. Our customer was Renee Delaney, a highly accomplished mini doll and toymaker. While we sat in the living room of her newly restored Victorian home, she showed us a 1/12th scale wax doll, made by Arlyn Coad, a Canadian puppeteer and IGMA artist. It was a wizened toymaker, carving a puppet. She said he needed a home. She then showed us a book illustrated by the Dutch artist Anton Pieck, and said, “I think he lives in a world like this.” We were immediately taken with the charm of his watercolors–an appealing old Europe/fantasy world, childlike without falling into “cute” or “sweet.” Playing around in other people’s imaginations—Pieck’s and Renee’s, not to mention multi-hundreds of years of aging–sounded like the beginnings of a great new project. 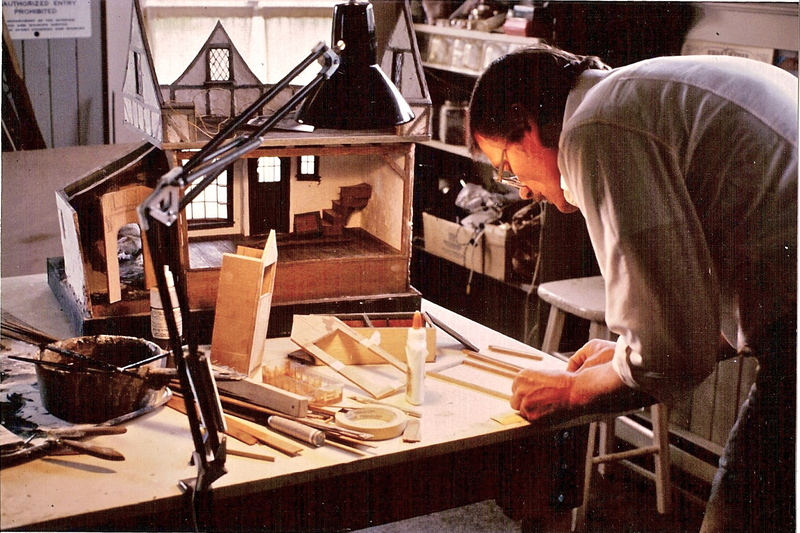 The timing of Pippen Hill was perfect—building a fantasy toymaker’s shop after months of working under the thumbs of Charles & Henry Greene’s exacting standards. It felt the way a horse must feel running free of saddle and bit–not a straight path to be seen. 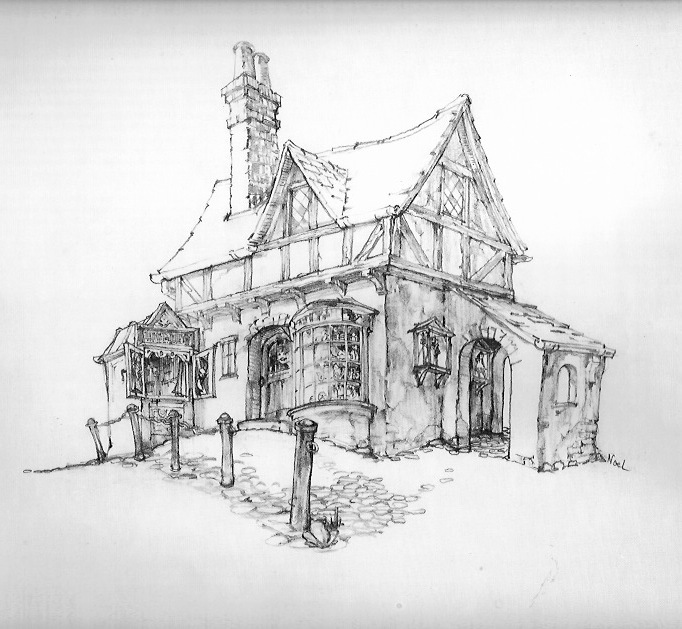 We were also free to come up with all the materials we’d never worked with before or knew where to find—wattle and daub, cobblestones for the terrain (great texture, as Pieck so wonderfully illustrated) and a slate roof. 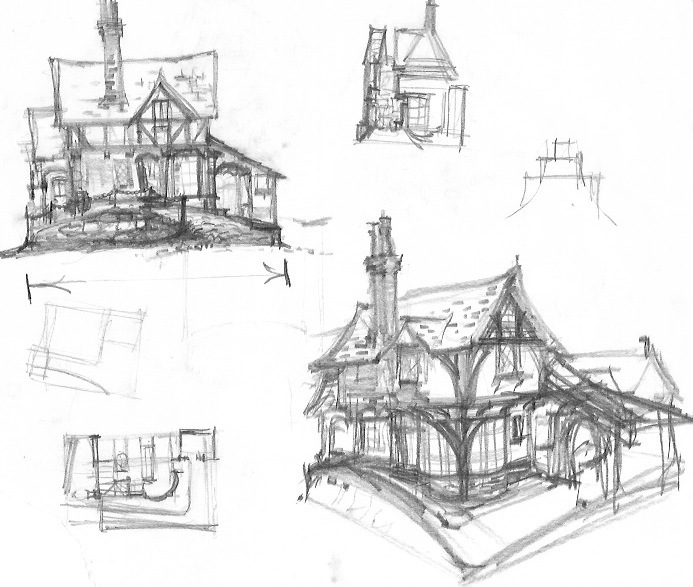 But that could be dealt with later, first Noel got to play with design. 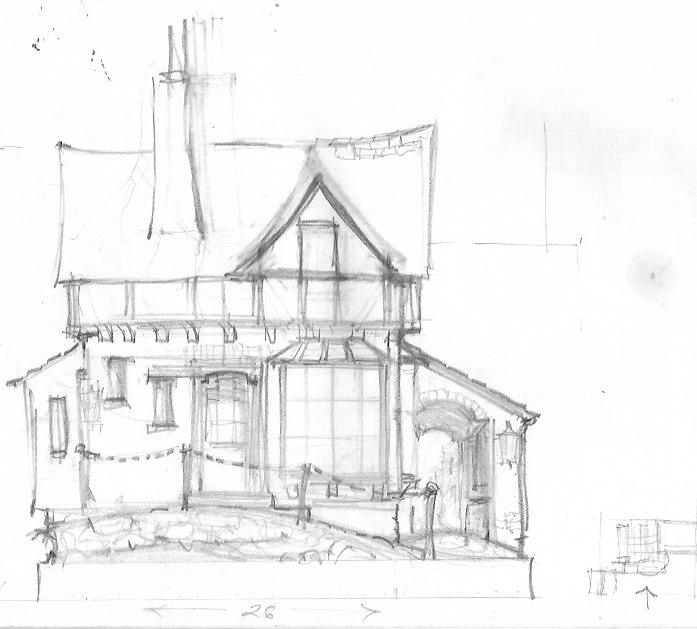 He came up with a relatively small project (26”wide X 19” deep) that included an alleyway, bow window, cobblestone street-front, and a portable puppet theater (to take to the park a la a Punch and Judy Show). Trotting out into the field, we just took each problem as it came. We built the initial structure, as always, from ¼” ply. The wattle (wooden framework), framework and beams were rough cut from and unknown wood—maybe mahogany. Noel remembers it was hard wood, and required a lot of wire-brushing and end-aging with an Exacto. It looks old to me, even before the Bug Juice, like something we scavenged. 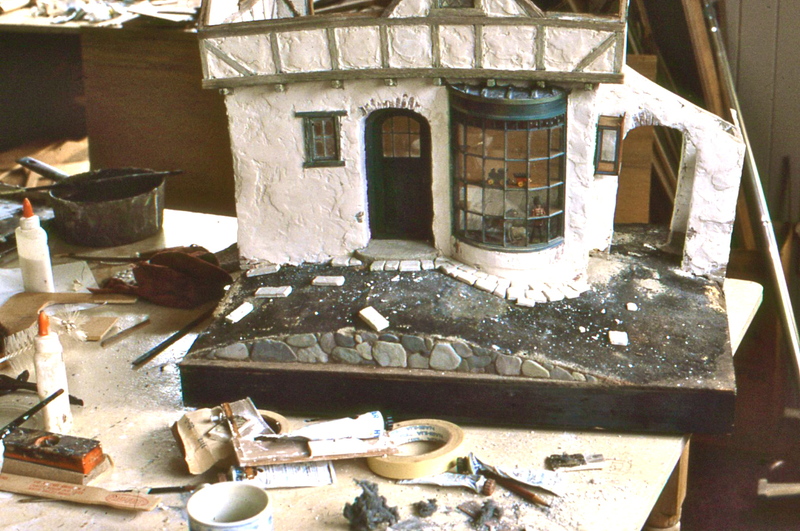 The “daub” was Plaster of Paris, with probably a little Acryl 60 cement adhesive added (a product which holds the plaster together, and to the wood, preventing chipping or powdering down the line). Jack Blackham custom cut the roof slates, each one with beautiful crisp edges I subsequently rounded and aged with needle-nose pliers. Because Noel designed-in an alleyway with diminishing perspective, I had to come up with cobblestones in ever-decreasing sizes. I think it was Mini Brick & Stone who made the bricks of a plaster-like material, tons of which I soaked in water and carved to the size and shape I needed. The facing stones at the front of the terrain look like flatish stones we must have found on the beach. The hill terrain has crumpled newspaper underneath, covered with a mix of sawdust, Elmer’s white glue, water, and Bug Juice to darken it. Once that mix is dry, it’s hard as stone. It can be painted with a diluted Elmer’s then sprinkled with sifted dirt, or sand, but for this we just glued the bricks and border paving stones right to the sawdust. Next post I’ll get into the glamorous shots. This time I’ll end as I began, with a sideline I can’t resist: the other night Noel dreamed that someone bought our Bug Juice formula for $60,000. Yahoo! And that was just the earnest money. Such are the dreams of ex-and-aged mini old house builders. 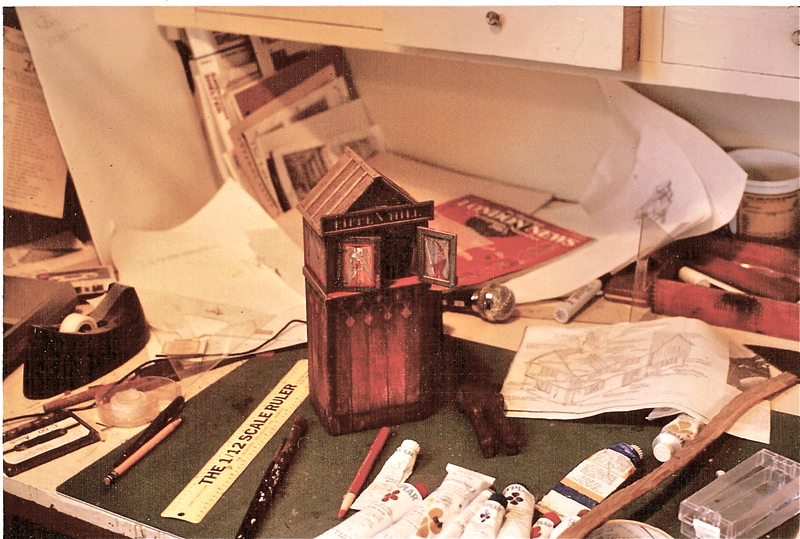 This entry was posted in Houses, Memoir, Miniatures and tagged architecture, dollhouses, wattle and daub, work style. Bookmark the permalink. Thanks Dianne–sorry our paths never crossed. Renee purchased the Toymaker doll from a woman who work she admired. I have forgotten the name of the maker maybe Arlen was the first name? I know it is was an unusual first name for a woman. I’d forgotten that–thanks, Karin. You obviously have a better memory than I! 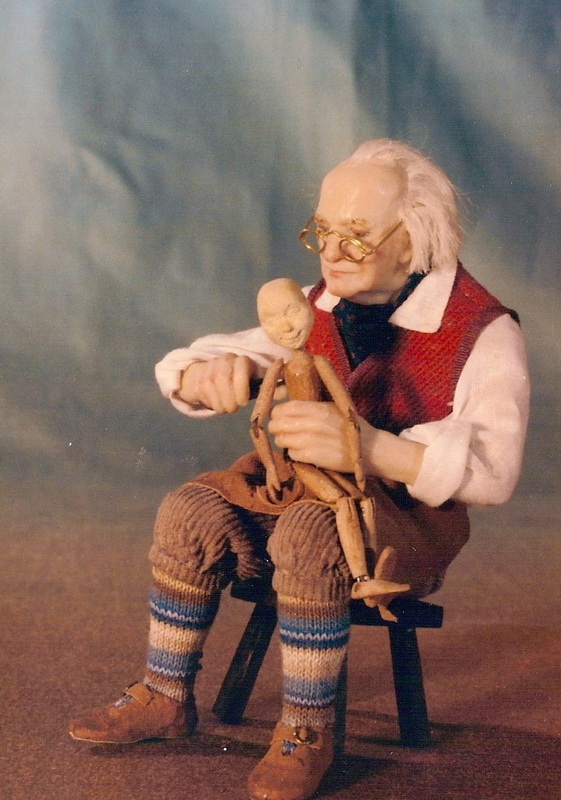 Renee sent me an email with all kinds of corrections, which I’ll write about in the next post, but you were right about the doll–it was made by Arlyn Coad, a Canadian puppeteer and IGMA artist. My mistake is double embarrassing because I knew Arlyn. Much as I enjoy reading your posts ….salivating over the houses and wishing that I had been able to have taken a class with you at Castine, The Pippen Hill has really got me excited for more photos, drawings …any and all images! What a beauty! I’m especially interested to see if you’ll enlarge at all about doing diminishing perspective. 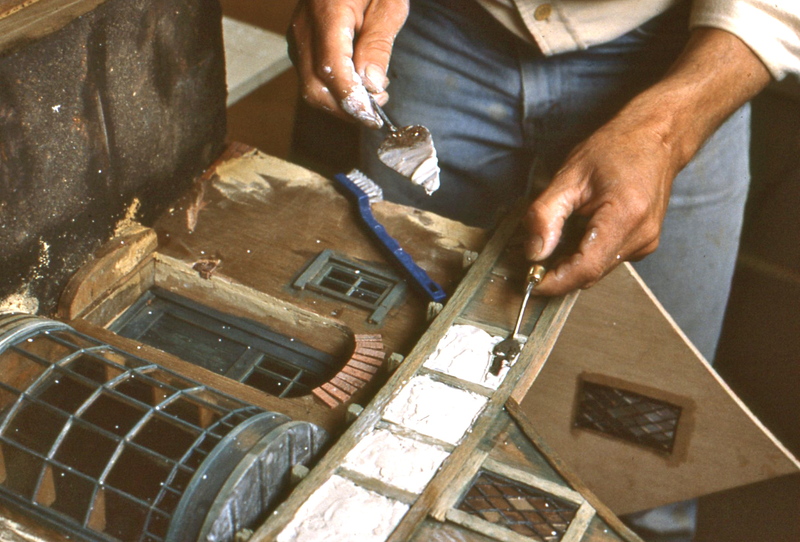 I’m using that technique in my next build ….or hoping to, and as usual it’ll have to be a by gosh & by golly progression for me. So perhaps you can remember, did you keep a specific angle/degree in mind when you used it? Or was a vanishing focal pt laid out on paper? Okay, Karin, I’ll do that. I hope that those of us who read the blog in the comfort of our own mail system get added to the totals of readers! It is so much fun to see the inside of the process…. I especially love the ruler labeled in really really big letters “The 1/12 Scale Ruler”. I imagine there is an interesting story that goes with that one! I love this style of architecture. This structure is so charming. I can’t wait to see more photos. I thought the name of this shop was Faces Of The Moon. Perhaps you built two toy shops in a similar style. I do not have all the old magazines with your building tips and techniques in them. How I wish I did! I suppose once those have been published they become the property of the magazine. Meaning, you could not reprint them for sale or use them in a book about your work or publish them for us in your blog. I have always hoped you would publish a book. Thank you for all these posts. Thank you, Catherine, this was a fun style to work in, and yes, we did Faces of the Moon in a similar vein. And yes, the magazines do own the rights. They claim one can buy our back issues through their websites online. If you join The Camp chatline, you could ask if anyone has extra copies or would be willing to make copies of their own. I’m the only one not allowed to copy my own work. OH MY! I wish that Noel’s dream comes true. The bug juice is certainly worth it don’t you think? I love this building style. I am always awed by your approach to a new project. Oh good, keep your fingers crossed! Part I | smallhousepress”. Do you mind in the event I personallyemploy some of your own concepts? Kaylene, Maybe you could explain more about what you mean by “personally employ our techniques.” If you mean using our techniques on your own miniatures, you are welcome to.